I'm talking about pepper. Salads, meat, soups, and stews aren't the only things that benefit from an application of pepper. There are good reasons it was highly prized by ancient peoples, and good reasons it's so appreciated by health professionals today. This vitamin-rich spice comes in a few varieties and has many uses-it's a spice that wears many hats. 1. Decongestant: Cayenne pepper warms the body and stimulates the release of mucus, which helps unclog nasal passages and lets you breathe easier. Here's how to make a VERY effective decongestant that honestly, tastes nasty, but if your nose is stuffed up, it is clears things out! Heat 1/2 cup of water in a tea kettle. When it boils add 1/4 cup apple cider vinegar, 1 teaspoon pure maple syrup, and 1 to 2 tablespoons of fresh lemon juice. Whisk in 3/4 to 1 teaspoon cayenne pepper (start with 3/4 and add more only if you can handle the extra heat). While the mixture is still steamy hot, breathe in the steamy, spicy vapors. When it's cool enough, drink up! You want to wait for it to cool off some, because this is not a sipping drink. Just get it down in a few gulps, if you can. 2. 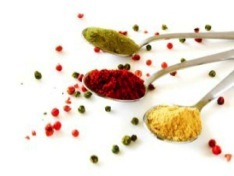 Constipation relief: Cayenne pepper makes you feel hot, which provokes you to drink more water, which loosens stools. Mix a teaspoon of cayenne into a glass of warm water. Or, just add cayenne to soups and stews, which will also give them a taste kick. 3. Cough remedy: Cayenne can help loosen chest phlegm and sooth throat irritation. The book, Herbally Yours, by Penny C. Royal, gives this recipe: Combine ¼ teaspoon each of cayenne pepper and fresh ground ginger with 1 tablespoon each of rawhoney and apple cider vinegar. Take one teaspoon at a time as needed. 4. Sore throat cure: To relieve sore throats, mix 1/8 teaspoon of cayenne pepper with 2 tablespoons of raw honey. Gargle a teaspoon of the mixture at a time. 6. Insecticide: To get rid of garden gnats, mix 1 teaspoon of ground cayenne pepper with 2 tablespoons each of dish detergent and vegetable oil. Add the mixture to a gallon of water and shake. Transfer to a spray bottle, and douse infested plants. Repeat after rain. 7. Deer repellent: Deer dislike the stinging sensation of hot pepper and learn quickly to avoid plants sprayed with a cayenne/water solution (the stronger the better). And if you add a little liquid soap to the solution, it will adhere better. 8. Squirrel repellent: Mix cayenne pepper with bird food. The birds don't mind the taste, and the Vitamin C in pepper actually improves their foliage. Squirrels, on the other hand, hate pepper and will avoid your feeder. 10. Rodent repellent: To keep rodents from chewing on outside wires and cables, coat them with liquid pepper. Rodents will stay away in droves.